A Koko blank fan card created using a printing plate like those to the right. ​Max truly loved making personal connections with his fans! One of the clever, and delightfully captivating, ways in which he enjoyed making that connection was by sending out personally inscribed cards to people who requested them. Max created several different whimsical card designs for this purpose. Each featured an image of one or more of Fleischer Studios' popular characters, and plenty of space for a personal message from Max Fleischer himself. Max starting sending out these fan cards in the 1930s and continued to do so into the 1960s! From the very start, he truly did inscribe virtually all these cards himself, which says a lot about Max and his very real affection for, and appreciation of, his many loyal and enthusiastic fans. Today these cards are popular with collectors, and occasionally can still be found for sale online. Since this was before computers, Max would create all the drawings for these cards by hand, after which they would then be made into printing plates that were mounted on a wood block for printing. What is little known is that Max created ‘templates’ to facilitate the writing of his messages. These templates allowed him to respond quickly to the numerous requests he received while still maintaining neat, even lines and ensuring that the text fit in the space allotted properly. Below are three alternate Fan Card designs. If it seems as if the dimensions of the Gus Gorilla Card are slightly different than the dimensions of the Betty Cards, then you have a good eye! While there is little variation in size amongst the various designs, there is some. The card far right, in which Betty has red lips, is an extremely unique, and may even be one-of-a-kind. 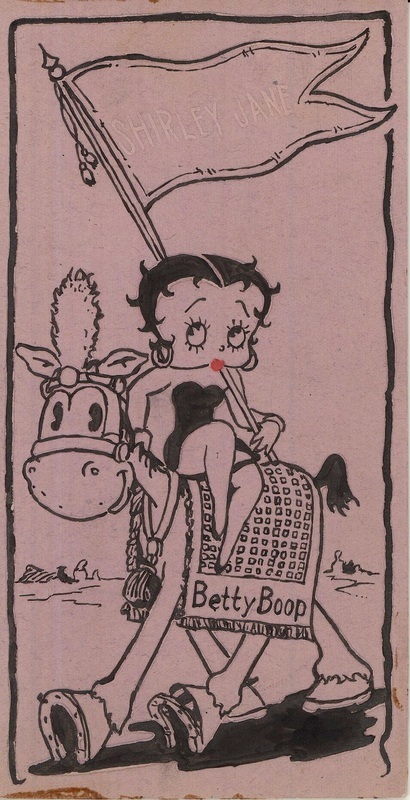 Not only does Betty have red lips on this pink-hued card, the black ink is actually embossed (making the artwork slightly dimensional). This may have been an experiment on Max's part. Do you have a Fan Card? Send us a photo of your fan card and we'll add it - and you - to our Fan Card exhibit. Help us make this the internet's largest collection of Fleischer Studios Fan Card images!! Use the form below to send us an image of your Fan Card. We prefer jpegs or pngs images, but can also accept pdfs. The higher the quality of the image, the more cleanly it will display on the site. We will credit you on the site, and all cards will be displayed along with the following Caution/Advice: "The following image(s) are displayed here with consent of third party individuals and are fully protected under the copyright laws of the United States of America, and all countries with which the U.S. has reciprocal copyright relations." Please be sure to include your name as you'd like to appear on the site. Any questions about this form? Email us directly by clicking HERE.